Everyone knows the tale of Snow white and the Seven Dwarfs. At least we think we do. The Grimm Brothers weaved a tale of the princess with lips as red as blood, hair as black as ebony and skin as white as snow who flees the stepmother who hated her. It is not really clear as to why the step mother hated her so much and why she wanted her dead but I digress. In the movie “Snow White: A Tale of Terror” we are taken on a different view of the classic tale. 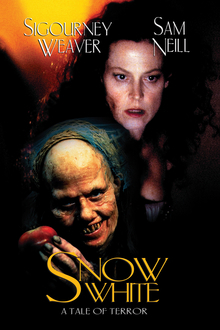 This movie starred Sigourney Weaver as the evil stepmother and Sam Neil as Lilliana (Snow White’s ) father. The movie depicts them as not the royal family we all think we know but as a noble family with servants and a nice home. The movie opens with the death of Lilianna’s mother who was also named Lilianna. This was not coincidence from the writers I would wager but that is ok. Fast forward about 8 years and we meet the stepmother from hell, Lady Claudia. On the outside she seems like the normal step mother but it is clear that Lilly does not like or trust her from day one. This is a departure from the tale that we all think we know as Snow White did not have a mean thought about her step mother as shown in the original text. It made for wonderful drama in this movie. The relationship grows and we are transported to the time of Lilly being a teen and still not happy with Claudia. At this point we also realize that Claudia is not what she seems…she is a witch who does not like the bond between her husband and step daughter. For this twist on the tale the reason for her hate is clear, she blames Lily for the death of the only child Claudia could have with Lily’s father (a boy no less) because it was clear to Claudia he loved Lily because of her resemblance to her mother. Claudia sends her brother Gustav, (the huntsman in the Grimm’s tale) to take care of Lily and of course she gets away. The dwarfs in this story are not really dwarfs at all, in fact they are almost all normal sized and quite honestly, all a bit nasty. There is a prince charming here but it takes the form of two different people…the man Lily falls in love with before she flees and one of the “dwarfs” later on in the movie. This was not something we see in the Disney movie or in the original text of the story as far as I remember. Keep in mind the Grimm tales were not meant to entertain children so much as teach lessons but again, I digress. The apple does play the traditional part in the story as does the step mother becoming the ugly woman but the demise of her character is decidedly more destructive. Let’s just say it gets a little warm. The movie is well written and given that it is a horror retelling of a classic fairytale it was a wonderfully acted spin on the classic tale. It is available on YouTube and I recommend anyone who likes this tale to check out this creepy, horrifying spin. I give it 5/5 stars and recommend it highly. Great review of the movie. I have loved this version of the story for a long time. In terms of reworkings that stick to the gist of the story, it ranks up there with the Helen Bonham-Carter (sp? )/Robert DeNiro version of Frankenstein in my opinion.